More than 60 years have passed since Irish-American director John Ford shot his classic movie The Quiet Man in Ireland. But interest in the film has never been stronger. Shot on location in the west of Ireland John Ford’s beloved romantic comedy The Quiet Man has been both reviled and celebrated for its larger-than-life portrayal of the Emerald Isle. 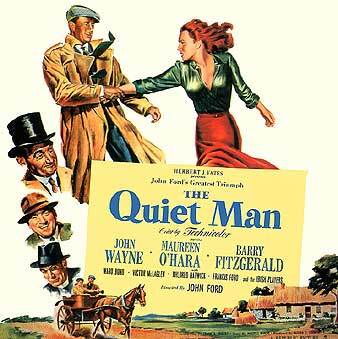 Most of the Quiet Man outdoor scenes were shot in various locations in counties Galway and Mayo - mainly around the scenic Maam Valley on the shores of Lough Corrib, Ashford Castle and the nearby village of Cong. John Ford was the youngest of 13 children and born Sean Aloysius O’ Fearna (Feeney) in Cape Elizabeth on the coast of Maine in 1895. His father was from near Spiddal in Galway’s Gaelteacht. The walled ruins of the old family cottage are still there and it is now home to a couple of greyhounds. And though somewhat off the tourist trail the cottage attracts a steady stream of John Ford and Quiet Man enthusiasts from all over the world. The first film Ford directed was the 1917 silent movie The Soul Herder starring Larry Carey. During his long and eventful career, he went on to direct other classics such as Stagecoach (1939), The Grapes Of Wrath (1940), How Green was my Valley (1941), She Wore a Yellow Ribbon and The Searchers (1956). But it was the Quiet Man what perhaps best showed his talent. It’s influence is still seen today. Even Stephen Speilberg paid homage to Ford in the hit film ET - where The Quiet Man can be seen on the family’s TV during the opening scene. 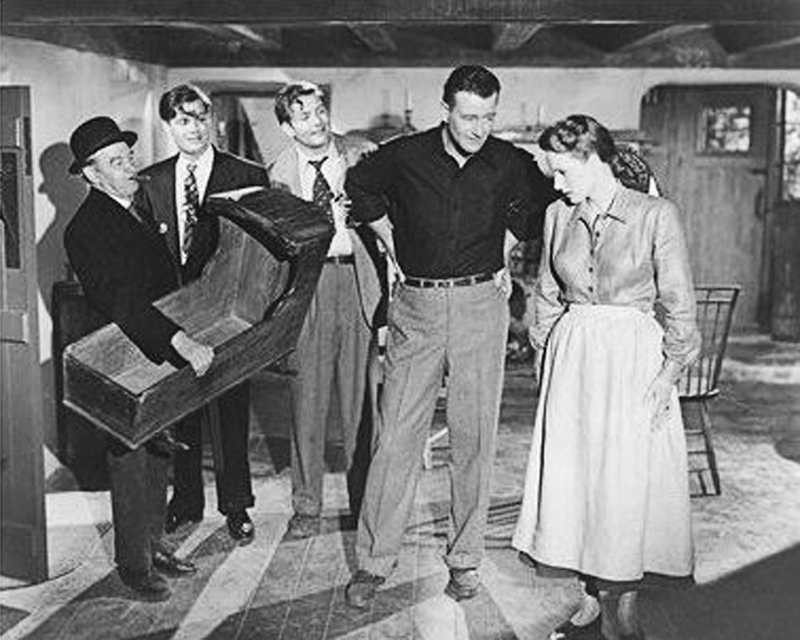 The Quiet Man was the first film to be shot in colour outside of America, and starred many of Ford’s favourite actors - John Wayne (who plays returned Yank and former boxer Sean Thornton), Maureen O’Hara (Wayne’s feisty love interest Mary Kate Danaher) and Victor McLaglen (Mary Kate’s headstrong brother Will Danaher). The legacy of the film is so strong it is now possible to experience some of that Quiet Man magic through an organised tour of the film’s locations in Ireland’s majestic west. The tour begins at Thor Ballylee just a few miles outside of Ardrahan in south Galway. A favourite haunt of WB Yeats, the location was used for the scene where courting couple Mary Kate and Sean manage to escape the watchful eye of their chaperone. Next stop is Ballyglunin, a now disused railway station between Tuam and Athenry where several scenes including the opening shot - Sean arriving at Castletown railway station - were filmed. Further west the stop is Spiddal in south Connemara near Ford’s ancestral home. There a relative of Ford named Bartley Feeney - whose two sisters and a cousin were extras in the film - runs a B&B. Bartley remembers Ford’s visits to his family home: “Every Sunday he’d call to the old house and bring John Wayne, Maureen O’Hara, Victor McLaglen an Barry Fitzgerald with him. He’d bring them all to the house and my mother would make them all tea. Ford used to fill John Wayne up with a lot of lies.” Ford visited the area many times and stayed locally with the late Lorn Killannin - former chairman of the International Olympic Committee - who helped him choose the various locations. Heading west to Oughterard the next stop is the famous Quiet Man Bridge just outside the town on the way to Clifden. The still-intact bridge was where Wayne’s character sat and heard his mother’s voice telling him about about the white O’Morn Cottage. In the film the cottage can be seen in the background but sadly over the years it has been neglected, and Quiet Man fans have removed stones as souvenirs. Still in working order is the nearby footbridge over the stream where Sean stood the first night he entered the cottage. Further north along the scenic shores of Lough Corrib to Cong and nearby Ashford Castle are many of the locations used for Castletown and Innisfree in the film. At the top of Cong village is Pat Cohan’s bar - one of the most photographed of all the Quiet Man locations. In fact, the property was never a pub and the interior shots were done in Hollywood. Owner Jack Murphy was an extra in the film’s famous fight scene - one of the longest in cinema history - and is always good for a Quiet Man story or two. He recalls extras got paid 30 shillings a day at a time when 10 shillings was an average man’s wage. “Extras were only allowed in one scene and were never asked back after that,” he remembered. “Ford did not want to get too familiar with anybody. He was very strict with that and jewellery. If you had any watches of emblems or anything on you it was taken off you before you went on set.” It may be more than 60 years since The Quiet Man was made but the memories are still fresh. The film’s magic still waves its spell in this corner of Ireland - and keeps the visitors coming. The Coiste Forbatha An Mháma is a non profit organisation whose aims are to promote tourism, greater national and international awareness and local business growth in the Maam Valley area.